Any time these four guys get together to do something nerdy, it's a good thing. 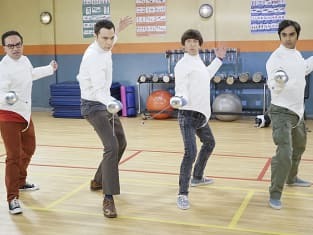 On The Big Bang Theory Season 9 Episode 5, Leonard, Sheldon, Raj, and Howard try out fencing in hopes of getting a little exercise. It's always fun to see the four of them attempt some new challenge together, all with their own uniquely geeky perspectives and expectations. The attempt at fencing also serves an important function when Kripke learns that Amy is recently single. Kripke expresses an interest in her, and Sheldon realizes that there's the possibility Amy could start dating someone else. 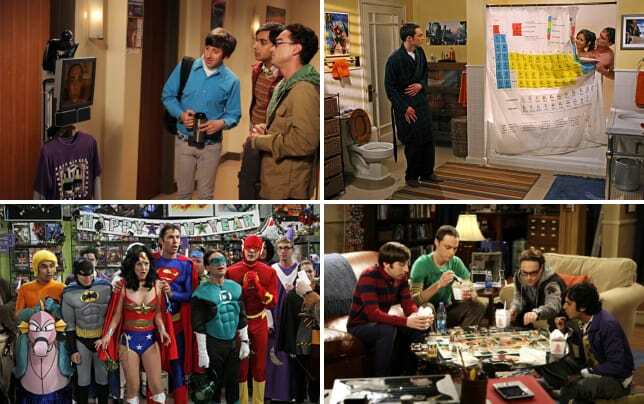 That's a tough pill to swallow, especially for Sheldon, who already has trouble understanding most social situations. I have to say, there's nothing quite like seeing Sheldon try to hit on women in a sports bar. What I appreciate about Sheldon's character is that he really doesn't know fear. He's also willing to do whatever it is that he think's he's "supposed" to do to move forward. If his friends tell him the best way to get over Amy is to try dating someone else, then he's willing to try – even if he thinks that means immediately going up to random women and asking them out. To him, and it's a simple as that: a problem and a solution. You have to love his honesty when he approaches them, too. Sheldon and Amy run into each other in the hallway (this is bound to happen from time to time) and both talk about moving forward. I see hope for these two here, because Amy gets just a little choked up by hearing that Sheldon wants to move on. I just hope that doesn't send her back to him, at least not any time soon. I want to see Sheldon learn and grow, then win her back once he does. The "filler" of this episode is everything that involved Stuart. Creepy Stuart isn't something we need to see this often, and his interactions with the women are just difficult to watch. And the camera thing? Gross. I know that Stuart was always a bit creepy, but he seems to have gotten worse lately. I'd much rather see Penny interacting with Bernadette and Amy, or Leonard and Penny enjoying life as the married couple who doesn't really live together.